Land Rover has unveiled a special edition Freelander ahead of the model's replacement with the Discovery Sport later this year. The Metropolis edition Freelander will be the most luxurious Freelander ever built, with premium Windsor leather, panoramic sunroof and 19-inch diamond-turned alloys. The range-topping Metropolis will cost £35,995 and go on sale in June. Standard equipment will include a full leather interior, electrically adjustable front seats, surround sound system and Xenon headlights with LED daytime running lights. Land Rover will also include a reversing camera, premium metallic paint and gloss black interior detailing. The Metropolis is joined in the range by the SE and SE Tech models which respectively replace the GS and XS designations. SE grade will start at £27,765 and represent the new entry point to Freelander, but include heated windscreen, front fog lights, front and rear centre armrests, 18-inch 10-spoke alloy wheels and colour-matched bumpers and sills. SE Tech models will start at £29,765 and add a more powerful, 380W Meridian audio system, touchscreen-controlled navigation, automatic headlights and wipers and 19-inch 10-spoke alloys. 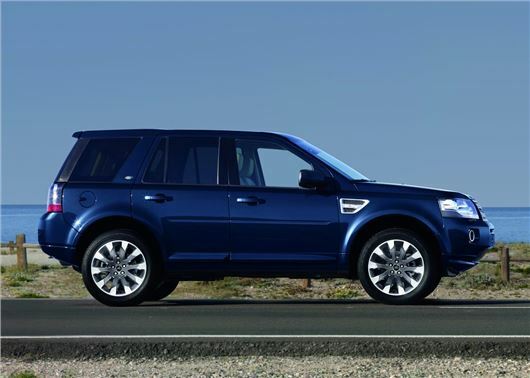 Freelander’s powertrain options have also been updated to include the TD4 engine with manual transmission in SE and SE Tech versions and the SD4 unit with automatic gearbox across the range.